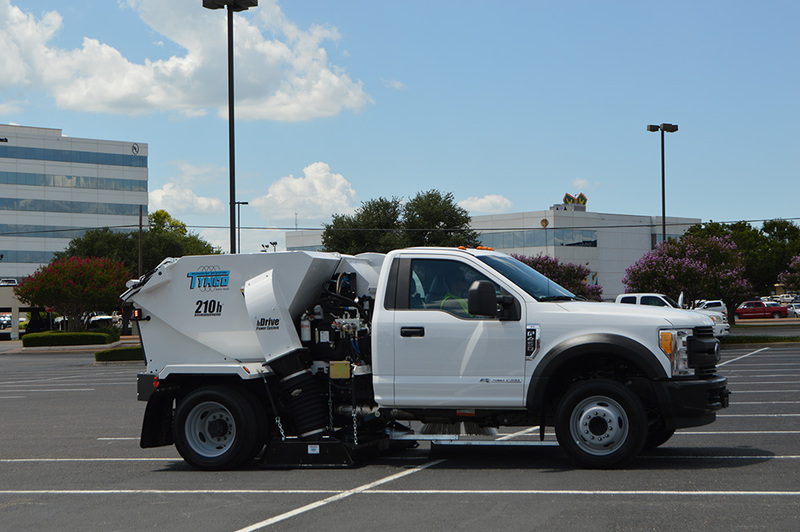 The TYMCO® Model 210h® parking lot sweeper is powered by the TYMCO hDrive®Power System. 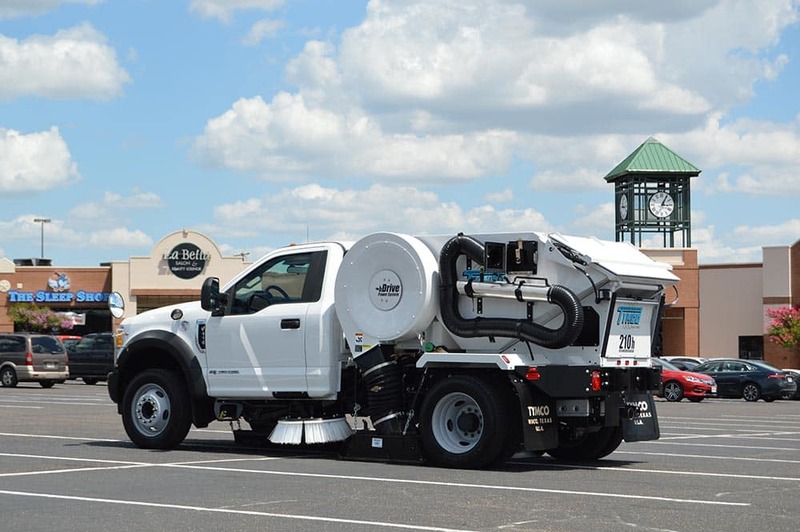 hDrive is an optimized hydraulic power system that gives Model 210h owners all the simplicity and low maintenance of sweeping without an auxiliary engine. 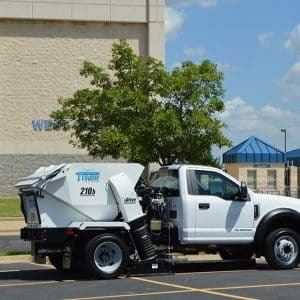 The Model 210h delivers everything Model 210 owners have come to love about the TYMCO Regenerative Air System – air sweeping with a dual chambered pick-up head delivering a powerful air blast to the paved surface and centrifugal dust separation for low dust emissions. 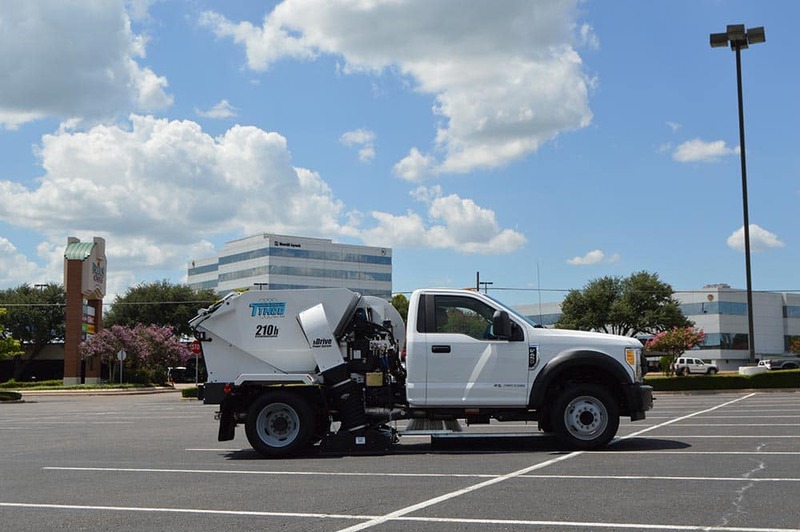 It was important for the Engineering Team at TYMCO to design a single engine parking lot sweeper with the least amount of compromise on performance while continuing to maintain a high standard of reliability. 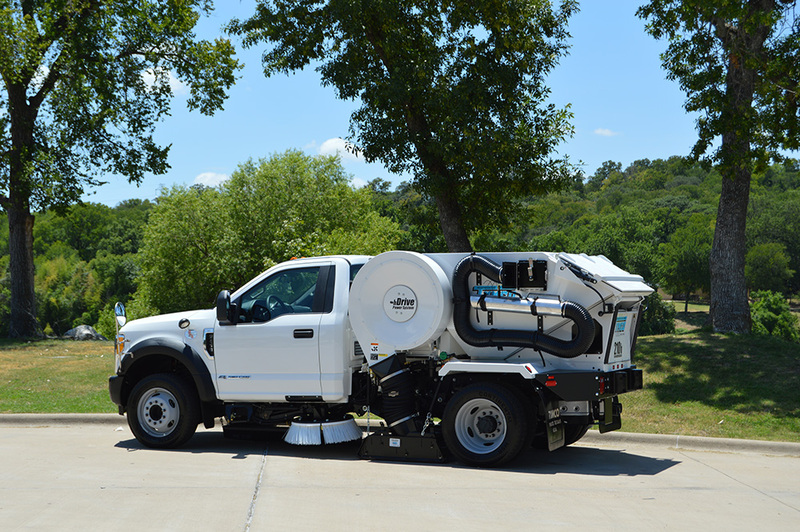 The performance features on the Model 210h are delivered by a True Regenerative Air System and a large gutter broom. Both of these features are powered by the hDrive Power System which were traditionally powered by an auxiliary engine on the Model 210. 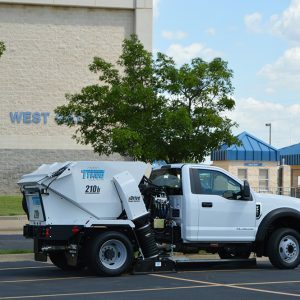 In addition, components such as the pick-up head, skids, curtains, and brooms are shared with the Model 210, easing fleet integration for current Model 210 owners. 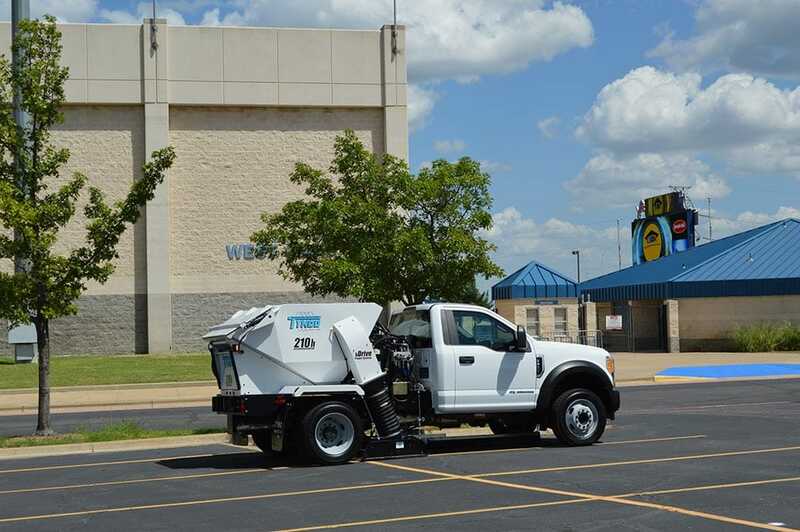 TYMCO Sweepers are designed in way that truly reflects the culture at TYMCO. 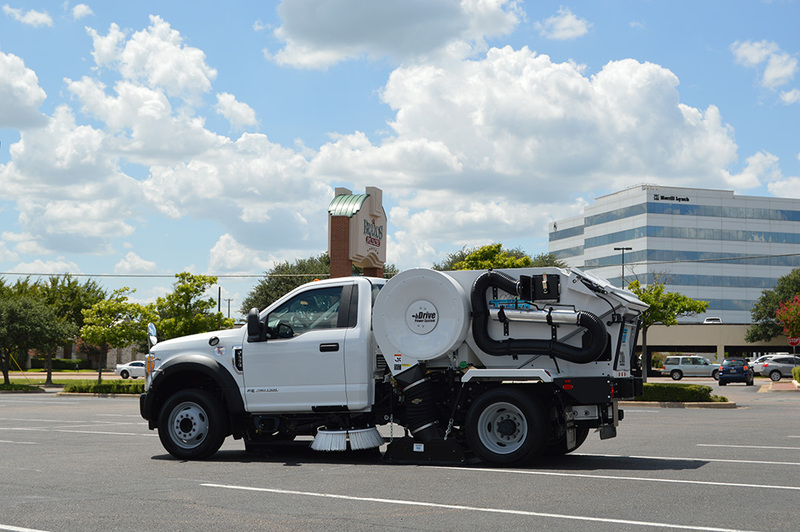 When our engineers approach a challenge or a need on the sweeper, they work to develop straightforward solutions. 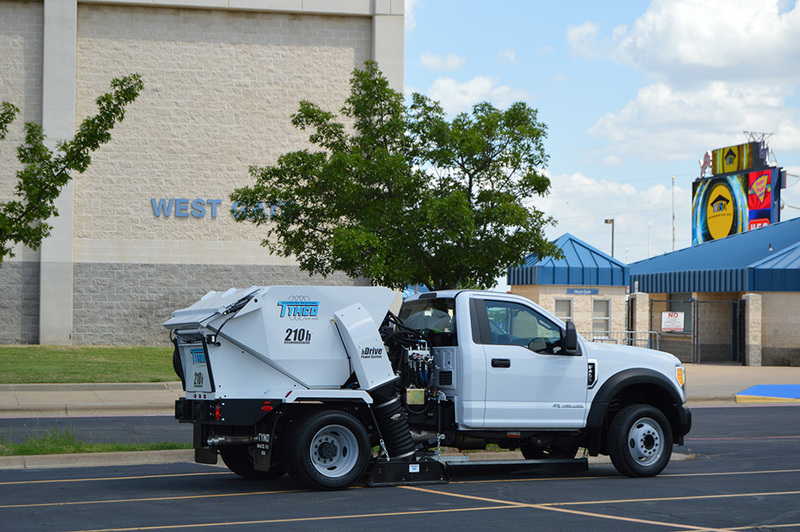 For example, all TYMCO Sweepers use True Regenerative Air. This design delivers the simplest approach as well as the highest performance with the lowest downtime as compared to other sweeper technologies. 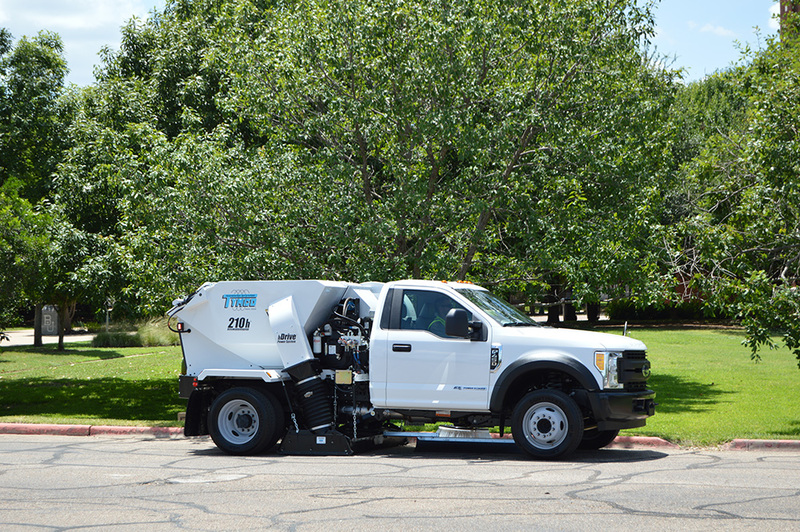 The Model 210h® control console utilizes lighted rocker switches for easier visibility when sweeping parking lots at night. 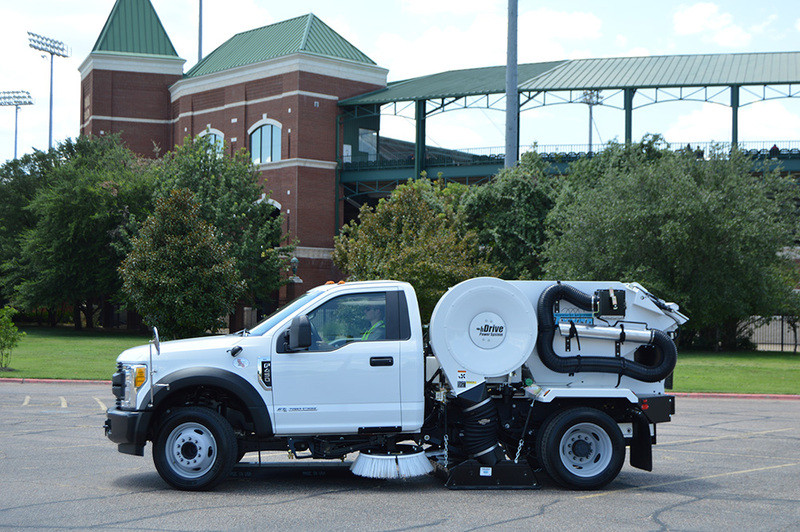 From within the cab, the operator can control the blower, pick-up head, gutter broom, dust control water system, all warning lights and the pressure bleeder. The control console also includes an hour meter. 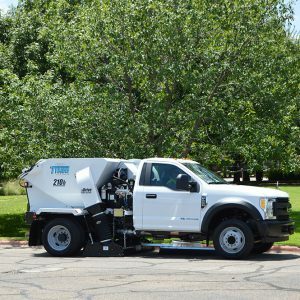 The TYMCO Model 210h® heavy duty pick-up head incorporates full-width air blast and suction and is designed to work effortlessly with the TYMCO Regenerative Air System to pick up a wide variety of parking lot debris from leaves and trash to dirt, sand, and gravel. The Model 210h pick-up head comes standard with long-lasting Duo-Skids® which provide increased sweeping performance and longer wear. 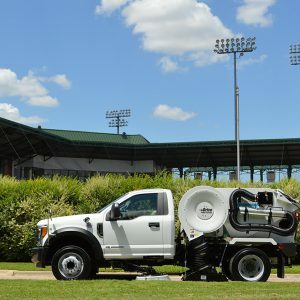 The Model 210h's powerful piggyback hopper dump cylinders lift the hopper up to 60 inches for dumping into dumpsters or containers commonly located near parking lots. 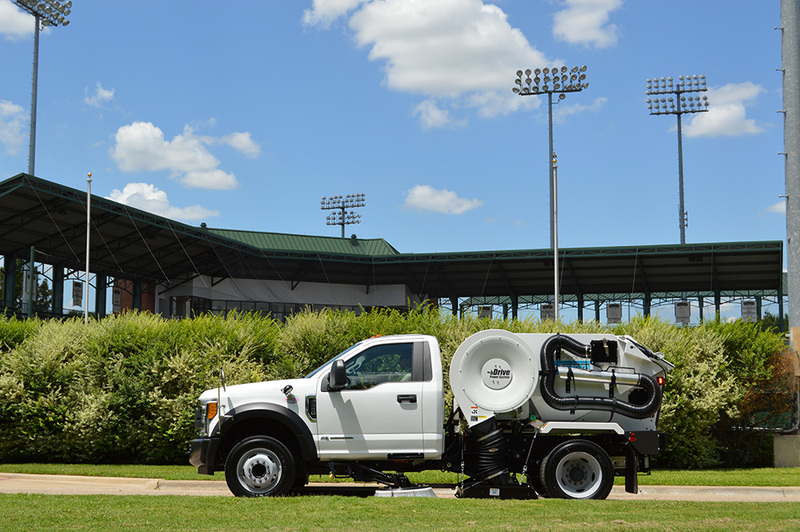 These heavy duty dump cylinders allow the Model 210h to high dump even the heaviest of loads. A built-in safety strut is permanently attached to the hopper frame for easy accessibility when performing routine maintenance. 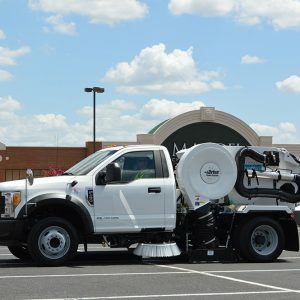 The 32” diameter Model 210h gutter broom removes debris from around parking lot islands, medians and parking bumpers. 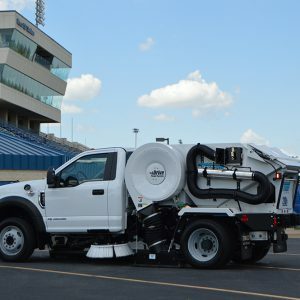 The innovative gutter broom provides excellent performance by automatically determining the “digging” pressure needed for different debris; therefore, owners get maximum gutter broom bristle life and sweeping performance. If the gutter broom encounters an immovable object, it will automatically retract to avoid potential damage and return to the original position once the immovable object has been passed, all without intervention from the operator. 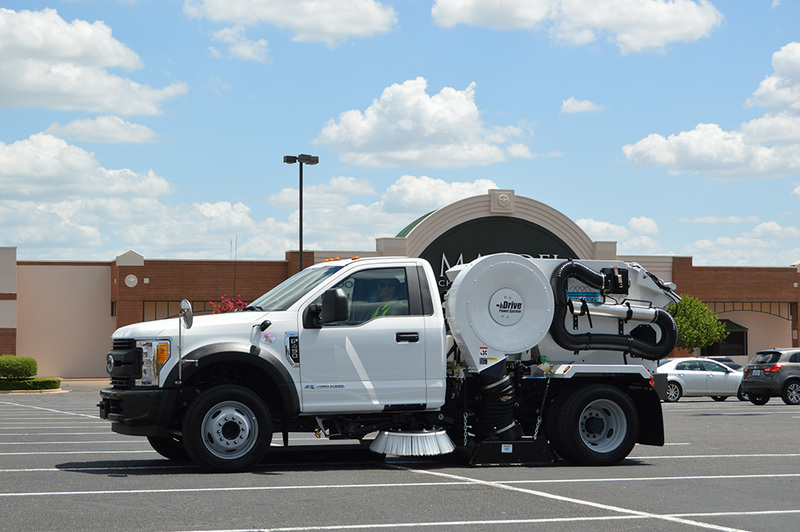 The 210h mounted on a Ford F-450 has gutter broom options with poly-wafer, poly-digger and steel digger bristles. 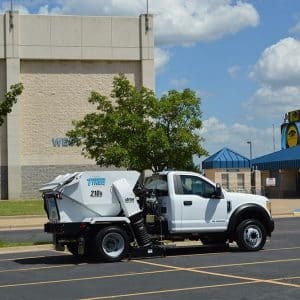 The Model 210h is the only single engine parking lot sweeper on the market with a high-efficiency centrifugal dust separator for maximum fine dust particulate separation which provides excellent dust control while using less water. 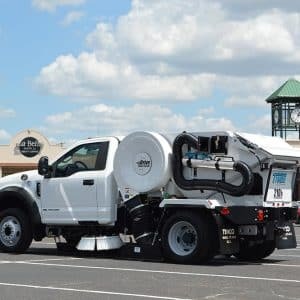 TYMCO’s Engineers take several aspects into account when designing for better dust control such as water nozzle design and placement, not just adding more water like other parking lot sweepers. 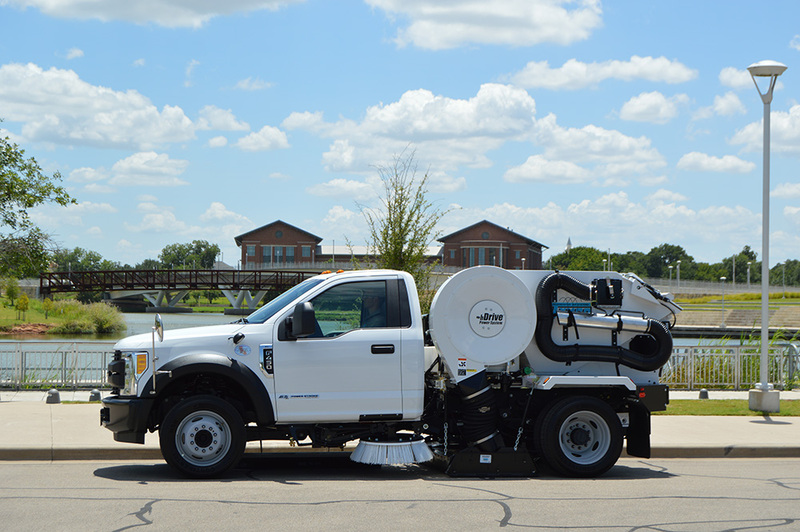 The Model 210h has a water capacity option of up to 30 gallons which provides hours of sweeping while maintaining excellent dust control. 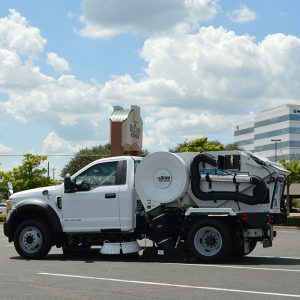 Ford Super Duty trucks offer the class-exclusive live-drive power takeoff (PTO) provision. Because it is integrated into the transmission’s design, integrating the TYMCO hDrive Power System with this PTO is a simpler, more robust design and requires fewer truck modifications than a belt-driven hydraulic system design. 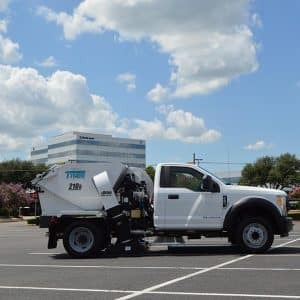 The live-drive PTO utilizes an output gear linked directly to the engine crankshaft that delivers power anytime the engine is running, whether you’re in motion or at a stop, which is perfect for an application like parking lot sweeping. 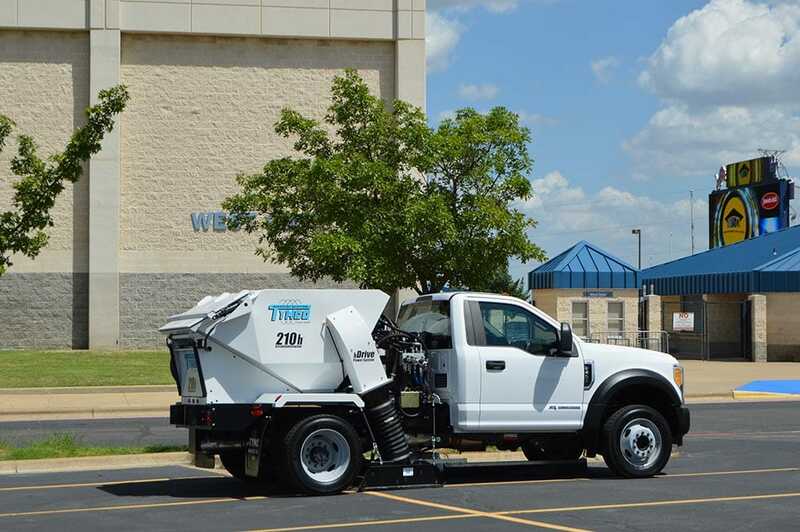 hDrive has also presented Model 210h owners a solution to noise pollution restrictions by offering inherent sound reductions as compared to the Model 210 when sweeping in normal conditions. 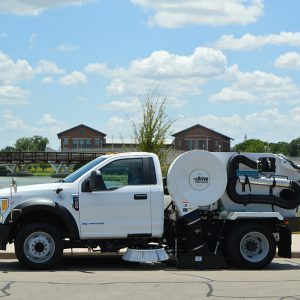 The Model 210h is the only single engine parking lot sweeper that utilizes a super-efficient aluminum alloy blower that is self-cleaning and reduces fuel consumption because of its lightweight design requiring less horsepower. 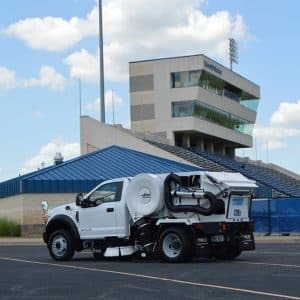 The blower is designed to work with the TYMCO Regenerative Air System to both push and pull air which delivers even greater sweeping performance. 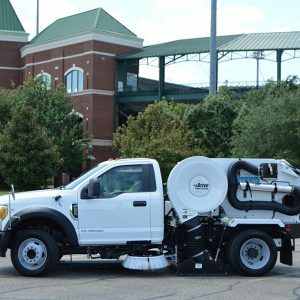 The Model 210h blower is available with an optional natural rubber coating providing maximum wear against abrasive debris. 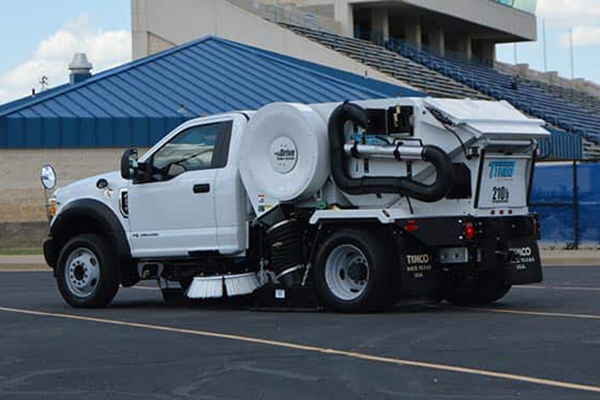 The TYMCO Model 210h® polypropylene-wafer gutter broom assists in removing debris from around parking lot islands, medians and parking bumpers with a 32" diameter gutter broom with in-cab controls. Steel digger gutter brooms are also available providing for more versatile cleaning and extended gutter broom bristle life. 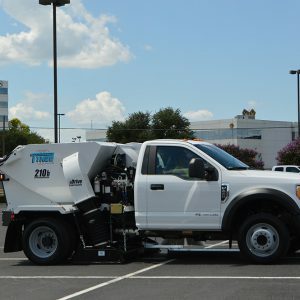 For cleaning in tight areas commonly found in parking lots and garages such as around dumpsters and containers. The 10’ hand hose is 6” in diameter and comes with a 36” aluminum nozzle. 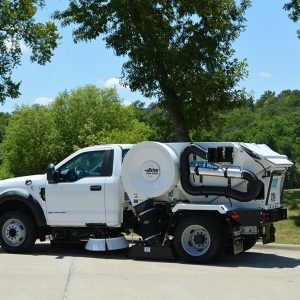 An additional 10’ hose is available with a quick coupler for even more versatile cleaning. Parking lots and garages are full of support beams, signs, light poles, trees and many other objects that need to be seen when backing up. The rear view back-up camera with in-cab display allows the operator to view the area behind the Model 210h while backing up providing additional safety and peace-of-mind to both Model 210h operators and owners. Additional cameras are also available to view the pick-up head and gutter brooms. Every parking lot has sidewalks that need to be cleaned. 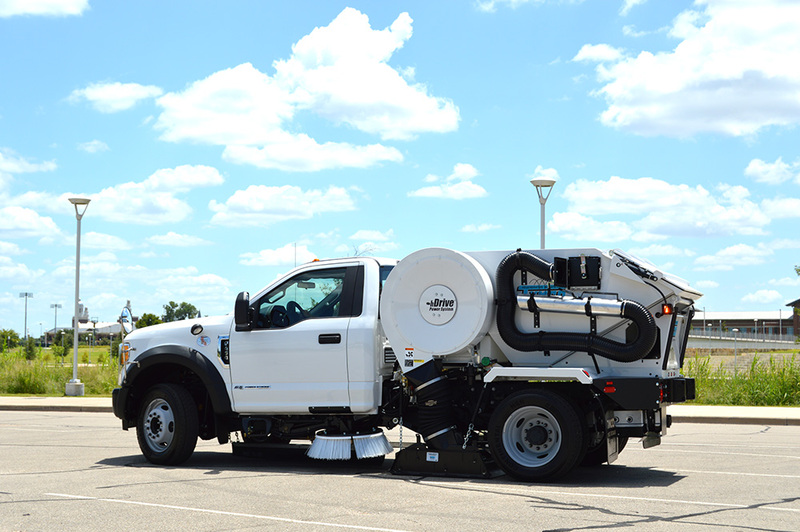 This storage box provides a place for the Model 210h operator to store a backpack blower to clean off sidewalks before sweeping the lot. For maximum corrosion and salt spray resistance, all hopper body sheets as well as the hopper screen are fabricated with low carbon, high chrome stainless steel. Stainless steel bolt-on blower housing, dust separator and hopper drain are also available. 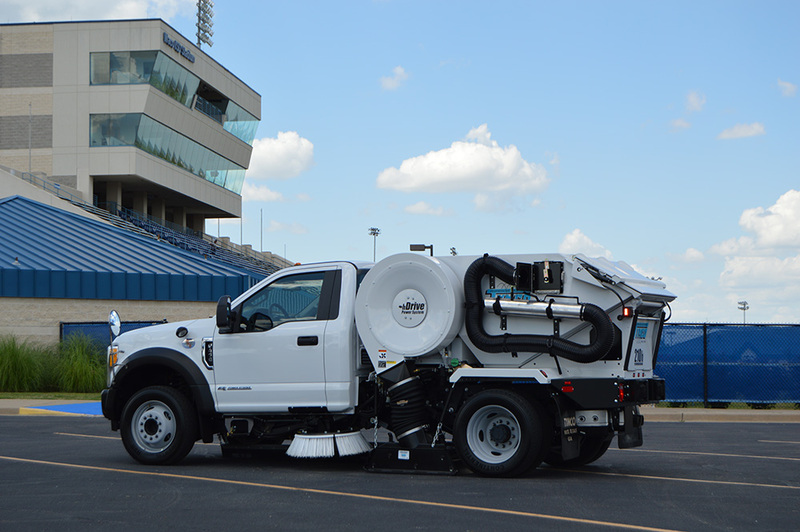 Multiplexed electrical system includes hardware and TYMCO designed software that integrates the in-cab controls to all sweeper functions; as well as provides intelligent safety features, assists in troubleshooting through LED input/output diagnostics, and controls the hDrive Power System. 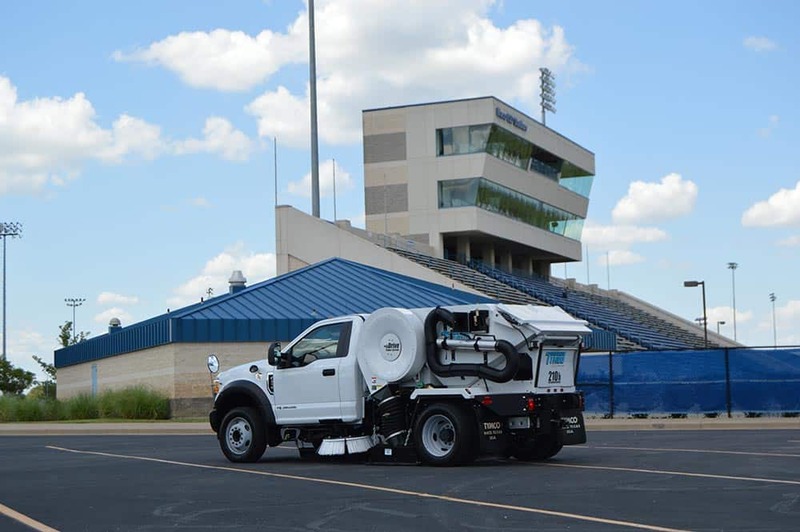 Specific to the 210h, BlueLogic communicates with the truck to engage the PTO and maintain the blower at a constant speed (low or high), and monitors and controls the hydraulic oil level and temperature shutdown system. 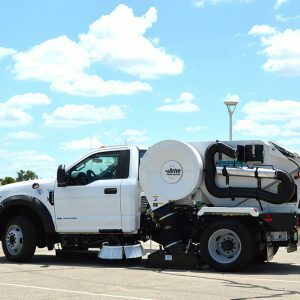 BlueLogic® Control System provides several safety interlocks which includes stopping the blower when the hopper is raised/hopper door is opened, shutting down the hydraulic system when hydraulic oil temperature is too high or the level is too low and disengaging the PTO when excessive ground speed is met (default is 18 mph). It also provides ASI, which will lift the gutter broom when the transmission is placed in reverse. Special options are available for your individual requirements. Contact your local dealer or TYMCO.